For those of us who commute, now the clocks have gone forward we can again enjoy the train journey to and from East Malling in the daylight and appreciate the fabulous scenery of the Kent countryside along the way. Admittedly, I'm usually asleep on the train in the morning, but it makes all the difference in the evenings. There's nothing worse as the working day draws to an end than the thought of getting on a train where all you can see is your own reflection. Anyway, this leads me on to East Malling train station or, as it was originally called, East Malling Halt when it opened in 1913. This information was sourced from a great site called Kent Rail. For those of you wondering what a 'halt' actually is (i.e. in terms of rail transport), Wikipedia has the answer: "a halt is a small station, usually unstaffed and with few facilities" and the entry goes on to say that many stations have now removed the use of 'halt' in the title, as in the case of 'East Malling'. I attach photograph of East Malling Halt taken circa. 1950 (thanks again to Diane Brazier for supplying me with this). It looks as though the photo was taken from the perspective of station car park (though I could be wrong). 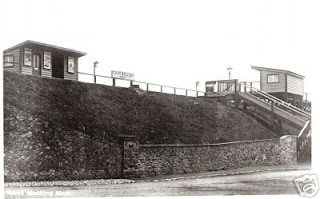 And could the hut on the adjacent platform be the one that stands there today? Although the hut in the photo looks as though it has a door to the left (a waiting room perhaps?). If any one has thoughts on this, or any more photos, please let me know. I remember as a small child going to and from East Malling Station, I was born in l;rkfield, but my grandpartents Sue And Fred Woodcock lived in Beech road. Many happy memories as a small boy i oftem pass through and a lump comes to my throat.